Former New York Yankees owner George Steinbrenner died this morning of a heart attack. He was 80 years old. While we don’t often note the passing of sports figures here at The A.V. Club, Steinbrenner’s reign (of terror, some would say) transcended sports to make him a pop-culture figure familiar to those who don’t know the first thing about baseball. The shipping company magnate bought his first sports franchise in 1960, the Cleveland Pipers basketball team, which ended up costing Steinbrenner a lot of money. Fortunately, he had a ton of it. Shortly thereafter, Steinbrenner dabbled in producing Broadway shows (including 1974’s Tony-winning Seesaw) before purchasing the Yankees—with a group of investors that also included similarly culturally transcendent automaker John DeLorean—from the CBS network in 1973. Steinbrenner quickly acquired the nickname “The Boss” and embarked on one of the most controversial and storied careers in sports history. Steinbrenner was such a fan, in fact, that he turned up to play himself in the 1996 episode "The Invitations," although the footage never made it to air. There are differing theories as to why: One has Steinbrenner taking issue with the way the episode cavalierly killed off George's fiancee Susan. Larry David said the scenes were cut after Steinbrenner decided, oddly, that George Costanza had been named and modeled after him. And still another explanation came from director Andy Ackerman, who had decided that casting the real Steinbrenner after having David voice him for so long was a mistake. On the Season Seven DVD release, all of these explanations were dismissed with the far more diplomatic "they were cut for time." In addition to his portrayal on Seinfeld, Steinbrenner himself was a familiar presence on television, turning up in a famous ‘70s Miller Lite commercial opposite Billy Martin. He later poked fun at his similarly contentious relationship with Derek Jeter in a 2004 Visa commercial. Steinbrenner also hosted Saturday Night Live in 1990 and appeared as himself in the Albert Brooks comedy The Scout—rare accomplishments for anyone in sports management. 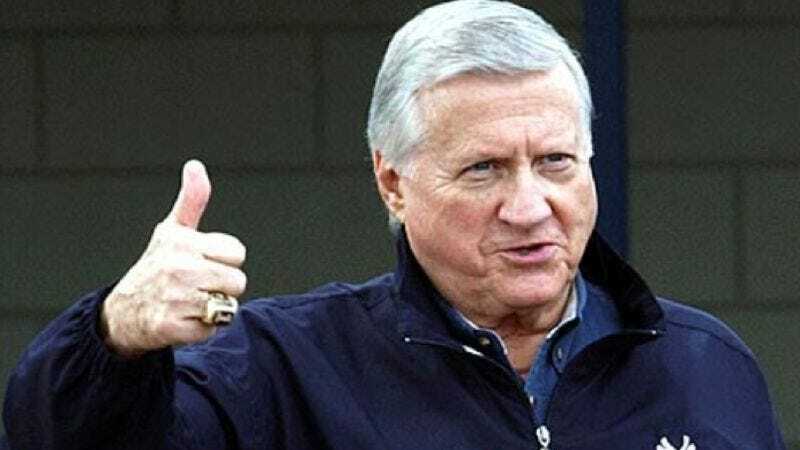 Throughout his odd, iconic career, he managed to be both self-deprecating and self-aggrandizing, establishing the Steinbrenner persona as a near-mythical mix of hubris, PT Barnum-like showmanship, Patton-like authoritarianism, and a dash of barely controlled rage. Love him or hate him, there will probably never be another like him.